What did you do after you heard the words, I’m sorry; you have cancer. Shake a fist at the heavens and ask, why me? Cry non-stop for five days? Beat yourself up over bad lifestyle choices? Draft a will? Plan a trip around the world? Some of the above? None of the above? Once he got the bad news that he had a seven inch osteogenic sarcoma growing in his left leg, Bruce Feiler, a 43 year old father of three year old twin daughters, took a walk down a different path entirely. First, he wisely connected with a talented surgeon at Sloan Kettering; a doc with surname to inspire any newbie cancer patient: Dr. Healey. Before long Bruce would surrender to a "Lost Year" consisting of multiple rounds of chemotherapy, high-risk surgery on his femur, physical therapy, recovery and healing. But soon after his healthcare team was chosen and an aggressive treatment plan was in place, Bruce took another important step. He wrote a letter to important men in his life ("…men who know me best…men who share my values…men who helped shape and guide me…men who traveled with me, studied with me, have been through pain and happiness with me…") asking them each to be members of what Bruce called a Council of Dads. Will you help be their dad? Will you listen in on them? Will you answer their questions? …Will you watch their ballet moves for the umpteenth time?…Will you tell them what I would be thinking? Will you tell them how proud I would be? Will you be my voice? The book introduces the six members of the Council of Dads in turn through the author’s recollection of vivid memories associated with each man. Before long the reader learns a special life lesson each can offer to the author’s young daughters as they grow up. Alternating chapters share Bruce’s letters to friends and family titled "Chronicles of The Lost Year" that update caregivers on how the patient is doing. "Monsters came into our home last year. They kept us awake for many months, but we worked together as a family, and, for now at least, they’ve gone down the stairs, out the door, and left us alone. We still shake occasionally in their wake. We have no guarantees they won’t come back. But if they do, we know that the most effective defense we can muster is the best offense we have: to work together as a family." The book also shines as a celebration of male friendship from childhood through mid-life. 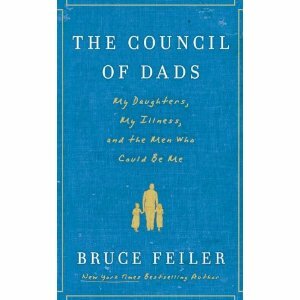 But, above all, The Council of Dads can be read as a beautifully written love letter, from one father to his two toddler daughters.